An apartment in the center perfect to go around by walk. 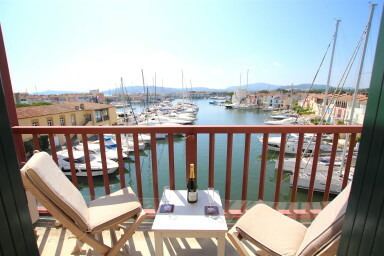 A pretty South-oriented studio apartment located in the center of Port Grimaud 1. On the lower floor, a living-room with a sofa-bed leading to a nice balcony, a well-furnished little kitchen and a shower-room and on the upper floor, a large bed and a sink. A balcony with a unique and wonderful view on the Marina. The shops are at the bottom of the buliding and the beach is only a few minutes away by walk. A cosy apartment well located to enjoy the "Cité Lacustre"